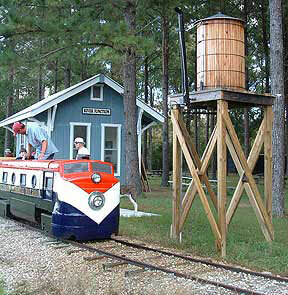 Most of 2002 was spent in finding and restoring a 1950’s National Amusement Device “24” gauge “Century Flyer” train set. It was recovered in derelict condition from a St. Augustine amusement park. In late 2002, construction of the track was started, made possible by generous support from the staff of Liberty Correctional Institution. Inmate labor crews, joined by experienced railroad men, had the first 2700 feet of track completed in three months. Construction could not have commenced without help from the Liberty County Road Department, which hauled in 65 trucks of fill dirt and the extremely generous donation of 300 cubic yards of crushed stone for the ballast by C. W. Roberts Construction Company of Hosford. Two containers donated by Smurfit-Stone Company were joined to make a secure tunnel and storage facility for the train and supplies. The tunnel is named in memory of Max Cooke, an ardent supporter of the railroad, who single-handedly restored the locomotive. 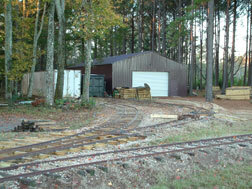 The railroad opened for runs in December 2002. There was no public money used in building or operating the initial railroad. Funding came from club activities such as rummage sales, railroad tie sales, cook-outs and memorabilia sales, as well as loans from club members. The electrical supply in the track area proved inadequate for our high usage during the Halloween and Christmas events. In 2005, we completed a major system expansion in the east loop. In 2006, capacity was expanded in the west loop nearest the depot. In 2007, the County received a Federal Highway Enhancement Fund Grant to expand the Railroad. During 2007—2009, the train track was expanded 3500 feet and a 3400 sq. ft. depot/Museum was constructed. Other work included a 400 foot trestle through a wetland area, a maintenance building, an additional tunnel-storage building, purchase of a full-size caboose for display; construction of a one-mile paved walking trail with night lighting. Also included in this major enhancement project was a large playground, the installation of a gazebo-bandstand for public events, renovated restroom facilities, extensive landscaping throughout the park and last, but not least, acquisition of a 2 ft gauge Crown live steam locomotive. The Veterans Memorial Railroad Golden Spike Ceremony was held May 9, 2009. The most exciting addition to the project was the purchase of the 2’ Gauge Crown Live Steam Locomotive pictured above with Chief Steam Engineer, Ray Brown, of Tallahassee on its debut run on May 9 at the Golden Spike Ceremony. This locomotive is the only coal-fired live steam locomotive operating in a public park in Florida. This little train requires a lot of muscle and work – an engineer and fireman in the cab to keep it running – shoveling coal and watching gauges. In 2011, the installation of a spur track was completed to accommodate the steam train’s access to refueling with coal and to the water tower, which was moved to the new depot. 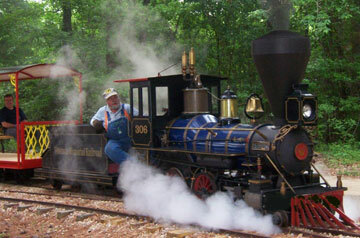 During 2011, the railroad carried over 3,500 children and adults on trips around the park for school field trips (during the school day), birthday parties, and special events sponsored by Veterans Memorial Railroad and the dedicated volunteers who provide the management and operation of the Railroad. 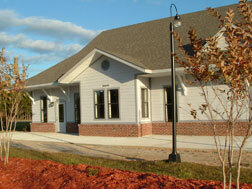 Veterans’ Memorial Railroad is under the jurisdiction of the Liberty County Board of County Commissioners. On February 6th, 2014, the Board appointed an Advisory Council composed of volunteers who manage and operate the Railroad.